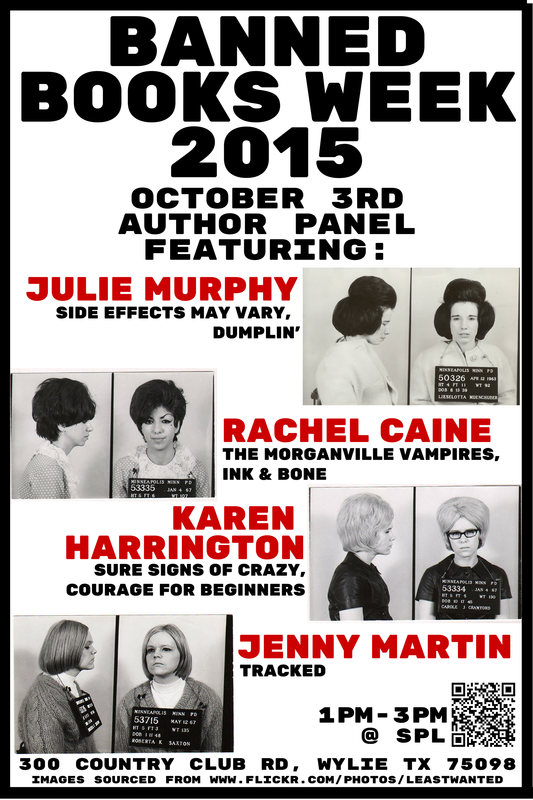 Wylie, TX, October 3rd, 2015 (1-3pm) – To celebrate Banned Books Week, Wylie’s Smith Library is hosting a young adult author panel and book-signing event Saturday, October 3rd, 2015, 1 to 3p.m., 300 Country Club Rd. The Smith Public Library will be hosting a young adult author panel not to be missed! This year’s lineup will be brimming with talent featuring several New York Times Bestselling authors, the middle and high school winners of the Texas Library Association’s (TLA) 2015 author spotlight of the year award, and much more! Julie Murphy, a self-proclaimed “potty mouthed Southern belle” will be there to answer questions on all things banned and young adult, as well as to discuss her most recent sophomore release. Dumplin’ was released September 15th and has already received much deserved praise, presently holding the #1 spot on the New York Times Children’s Bestseller List. Dumplin’ is the story of Willowdean Dickerson, a self-proclaimed “fat girl” growing up in Texas with a mother that heads the local teen beauty pageant. Willowdean’s thoughts on obtaining the perfect bikini body are simple, put a bikini on it! The self-assured Willowdean has always been okay in terms of body acceptance. However, when the handsome ex-jock Bo from the local private school shows romantic interest in her, Will’s confidence is shaken. In rebel misfit fashion, she enlists in the Miss Teen Blue Bonnet Pageant. Rachel Caine will also be joining the panel who is the New York Times Bestselling author of over 40 books, as well as one of TLA’s High School Spirit of Texas (SPOT) Authors to Spotlight 2015 List. She will be promoting her latest release Ink & Bone, the first in a promising new series. Imagine a world where the Great Library of Alexandria never burnt down and ruthless librarians are the keepers of all the information, magic, and power. A riveting read that brings up pertinent questions involving censorship, and who wields the power. A perfect fit for Banned Books Week! Karen Harrington, named one of TLA’s Middle School (SPOT) Authors to Spotlight for 2015 will also be in attendance. Karen’s latest release, Courage for Beginners is the story of Mysti Murphy, a seventh grader whose best friend ditches her to try a social experiment as a “hipster”, and has a father in the hospital and an agoraphobic mother. What would you do in such a predicament? Well, you grow some courage and life coping skills, which is exactly what Mysti does. Harrington will also be discussing her recently announced forthcoming novel, May Day. Rounding out the panel will be debut author Jenny Martin. Her novel Tracked has been compared to the likes of Star Wars, meets Fast & the Furious, in space. I found it to be compelling sci-fi with a street racing twist, and a tough yet human renegade female drag racing protagonist named Phee. Join Wylie to celebrate the freedom to read, raise censorship awareness, and enjoy an afternoon of captivating young adult authors who are defying young adult tropes and breaking barriers. More Information: This event is free and all ages are welcome. Representatives from Barnes & Nobles will be providing books by the authors for purchase. This entry was posted in Smith Public Library and tagged Banned Books, Banned Books Week 2015, Censorship, Courage for Beginners, Dumplin', Ink & Bone, Jenny Martin, Julie Murphy, Karen Harrington, Rachel Caine, Smith Public Library, Tracked, Wylie Texas. Bookmark the permalink.